An unmissable meeting for the researchers and clinicians of the "Greater Southwest Region" in France, the 14th edition of the Cancéropôle Grand Sud-Ouest scientific Days is a place of exchange which enables to review the programs and strategic orientations in the field of cancer research. This year, it took place from November 21st to 23rd 2018 in Montpellier (France). 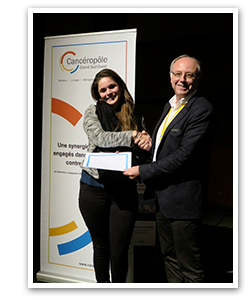 The SILAB - Jean PAUFIQUE Corporate Foundation supported a young deserving team in the study of skin disease treatments by offering a “young researcher” poster prize. The 2018 prize-winner is Margaux Sala for her poster entitled “Involvement of discoidin domain receptors in the resistance to targeted bi-therapy during melanoma”. The research work is conducted within INSERM U1053, BaRITOn team (Bordeaux Research In Translational Oncology), in Bordeaux (France). 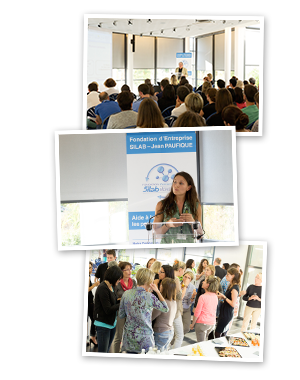 On June 2018, 28, the annual meeting of the SILAB - Jean Paufique Corporate Foundation gathered almost 120 people within SILAB premises, in Saint-Viance (Corrèze department, France), who attended the presentation of the 11th prize winner and discovered the current research work supported by the Foundation. This day was orchestrated by Brigitte Closs-Gonthier, administrator and scientific director of the Corporate Foundation, and brought together the members of the scientific committee as well as SILAB staff. The brilliant 2018 prize-winner, Joudi Bakar, came to explain her research project which receives the financial support of the Foundation for the next two years: “Diagnosis of the pathological cutaneous barrier: multimodal approach of the lipid biosynthesis on cellular models”. The studies are conducted within the Interdisciplinary Academic Unit Lip(Sys)2: Lipids, analytical and biological Systems, attached to the university of Paris-Sud, faculty of pharmacy, under the supervision of Prof. Arlette Baillet-Guffroy and Mrs Rime Michael-Jubeli. This scientific meeting was also an opportunity to follow the progress of the research projects of the two previous prize-winners, Thomas Bertero (2017) and Jonas Ogien (2016). It ended with a cocktail, during which prize-winners, members of the Foundation and SILAB staff could exchange together in a friendly atmosphere. 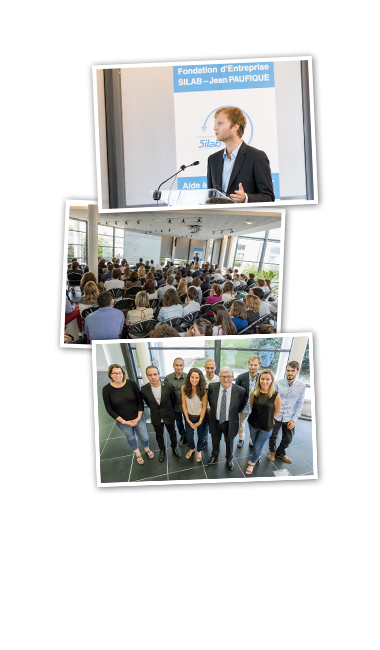 The 10th annual meeting of the SILAB - Jean PAUFIQUE Corporate Foundation took place on Thursday, June 29 2017 at the SILAB headquarters in an atmosphere even more festive than usual. To mark this anniversary, the prize-winners from the last ten years or their laboratory managers, the members of the Scientific Committee and the Governing Body as well as SILAB company employees gathered together with the Founder, Jean PAUFIQUE. In total, 140 people attended the various scientific presentations. Unanimously selected by the Foundation's Scientific Committee, Thomas BERTERO, the tenth award winner, presented his research work. His project entitled “the influence of the mechanical properties of the tumoral niche on the Squamous Cells Carcinoma metabolism” will receive financial support from the Foundation for three years. The research is carried out at the Institute for Research into Cancer and Aging (IRCAN) in Nice, under the supervision of Dr. Cédric GAGGIOLI. It was also an opportunity to follow the progress of the research project of Jonas OGIEN, the 2016 award winner. The research was carried out in the “Biomedical Imaging Systems” team at the Charly Fabry Laboratory in Palaiseau. 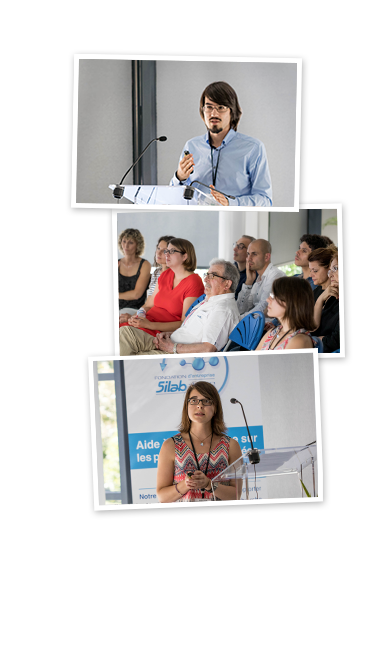 The 9th annual meeting of the SILAB - Jean Paufique Corporate Foundation took place on Thursday, June 23, 2016 at the SILAB offices. Over 100 people attended the afternoon of seminars orchestrated by Brigitte Closs-Gonthier, administrator and scientific director of the Corporate Foundation, surrounded by members from the Scientific Council and company employees. Unanimously selected by the Foundation's Scientific Council, Jonas Ogien, the 2016 winner, presented his research work. His project entitled "Microscopy by high-resolution, augmented-contrast optical coherence for non-invasive diagnosis of skin cancer" will receive financial support from the Foundation for two years. The research will be carried out at the Charly Fabry Laboratory in Palaiseau, part of the Optical Institute Graduate School, under the supervision of Arnaud Dubois, Professor in charge of the "Biomedical Imaging Systems" team. It was also an opportunity to follow the progress of the other research projects currently supported by the Foundation. Laura Cau and Laure Gibot, the award winners in 2014 and 2015, were therefore in attendance, accompanied by their respective sponsors, Marie-Hélène Ratinaud and Vincent Sol. This year, Elodie Henriet, 2015 winner of the poster prize awarded by the Foundation at the 11th Cancéropôle Grand Sud-Ouest, also took part in the day. 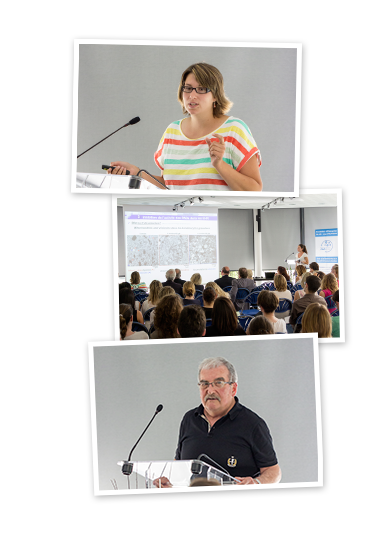 She presented her work on "Discoidin domain receptors involvement in melanoma progression and invasion", carried out under the responsibility of Frédéric Saltel, CR1 INSERM, cytoskeleton and cancer team at the GREF in Bordeaux, INSERM Unit 1053. The scientific conference ended with a cocktail reception where the prize winners, members of the Foundation and SILAB employees were able to enjoy a friendly discussion. 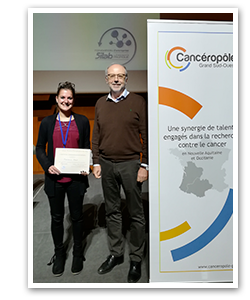 The SILAB - Jean PAUFIQUE Corporate Foundation rewarded Mrs Elodie HENRIET for her poster entitled “Discoidin domain receptors involvement in melanoma progression and invasion”, during the 11th days of Canceropole Grand Sud-Ouest, that held in Bordeaux on 5 and 6 of November, 2015. The works are conducted under the responsibility of Frédéric Saltel, CR1 INSERM, cytoskeleton and cancer team at the GREF in Bordeaux, INSERM Unit 1053. 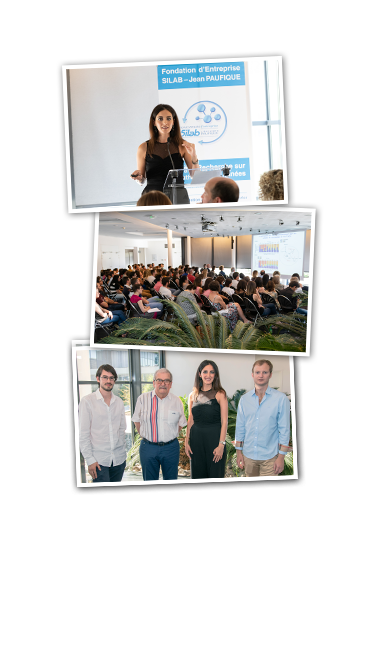 On 25 June 2015, for its 8th annual meeting, the Corporate Foundation gathered around 100 people at the premises of SILAB, in Saint-Viance, to present the new 2015 prize-winner and the research projects in progress supported by the Foundation. This day was orchestrated by Brigitte CLOSS-GONTHIER, administrator and scientific director of the Corporate Foundation, surrounded by the Scientific Council members and the staff society for a pleasant and friendly time. Laure GIBOT, the 2015 prize-winner of the SILAB - Jean PAUFIQUE Corporate Foundation, came to present her research project which receives the financial support of the Foundation for the next two years. The project that was selected is dedicated to « Electroporation associated to calcium to treat melanoma ». The research works are carried out in the Institute of Phamacology and Structural Biology in Toulouse, within the Marie-Pierre ROLS team, research director in charge of the Cellular Biophysical team. This day also led to discover the scientific progress of the two previous winners, Mr Yann CHELI and Ms Laura CAU, winners 2013 and 2014 respectively. The scientific meeting was closed by a cocktail where winners, foundation members and SILAB employees have discussed in convivial atmosphere. 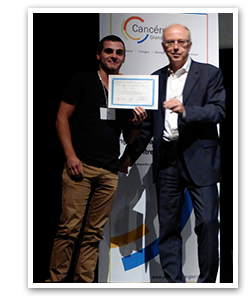 The 10th days of Canceropole Grand Sud-Ouest, that held in Toulouse on 16 and 17 of October, 2014, received a support of 2 000€ from the SILAB - Jean PAUFIQUE Corporate Foundation. The foundation notably rewarded a worthy young team working on skin disease therapies by offering a poster prize for young researcher. The prize-winner is Mr David GARANDEAU for his poster entitled “Sphongosine 1-phosphate metabolism: new regulation pathway from the sensitivity of melanoma cells to targeted therapies”. Works were conducted in the Cancer Research Center of Toulouse, Sphingolipids, Cell death and tumor progression team - UMR 1037 INSERM, under the direction of Pr Thierry LEVADE. On 26 September, the SILAB - Jean PAUFIQUE Corporate Foundation organized on the premises of the SILAB company, its 7th annual meeting, orchestrated by Brigitte CLOSS-GONTHIER, administrator and scientific director of the Corporate Foundation. Laura CAU, the 2014 prize-winner who receives the financial support for the next three years, introduced her works to the foundation scientific committee and to the SILAB team. Her research project is dedicated to « Importance of the desimination in the epidermal homeostasis ». The works are carried out in the UDEAR-CNRS unit, University of Toulouse, in the Dr Michel SIMON team that is worldwide known as specialist of the desimination study in the skin, and conducted by Pr Guy SERRE. Dr Michel SIMON and Pr Hidenari TAKAHARA, University of Ibaraki in Japan, are the co-directors of this project. This day also led to discover the scientific progress of the two previous winners, Mr Yann CHELI and Miss Laëtitia DOUGUET, winners 2013 and 2012 respectively. The deadline for submitting application files for the 2014/2015 research funding is extended to Friday 31 October, 2014. Information about 2014/2015 research funding are only available in French version. The 9th days of Canceropole Grand Sud-Ouest, that held in Limoges on 16, 17 and 18 of October, 2013, received a support of 2 000€ from the SILAB - Jean PAUFIQUE Corporate Foundation. The foundation notably rewarded a worthy young team working on skin disease therapies by offering a poster prize for young researcher. 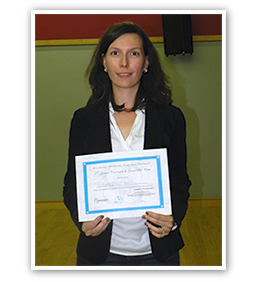 The prize-winner was Mrs Cécile DESJOBERT-HOUITTE for her poster entitled “Epigenetics and melanosomes aggressivity”. Works were conducted in ETaC laboratory (Epigenetic Targeting of Cancer – Pharmacochemistry of cancer epigenetic regulation) of Toulouse, under the direction of Dr Paola ARIMONDO.